Visualize vehicle flight dynamics using either the MATLAB graphics-based 3DoF and 6DoF animation blocks or the third-party FlightGear flight simulator. 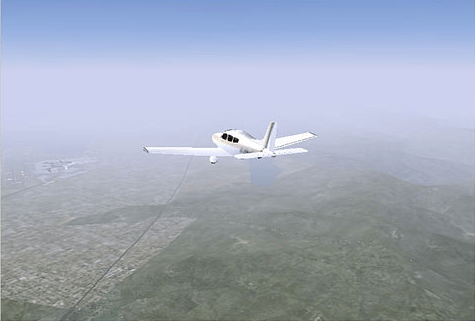 FlightGear is open source software available through a GNU General Public License (GPL). You can define geometries using MATLAB variables, MAT-files, AC3D files, or custom formats. All animation library blocks support Simulink® external mode execution for visualizing your rapid prototyping and hardware-in-the-loop applications. 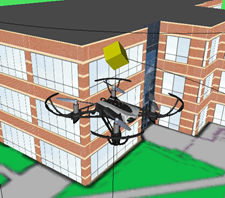 Use Simulink® to model a quadcopter, based on the PARROT® series of mini-drones. To manage the model and source files, it uses Simulink® Projects. 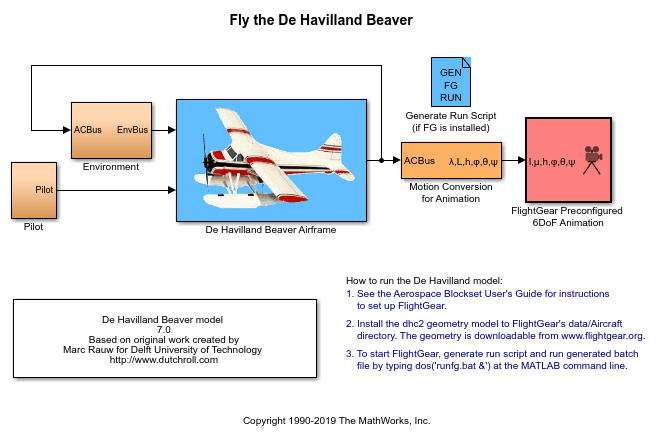 How to model the DeHavilland Beaver using Simulink® and Aerospace Blockset™ software. It also shows how to use a pilot's joystick to fly the DeHavilland Beaver This model has been color-coded to aid in locating Aerospace Blockset blocks. The red blocks are Aerospace Blockset blocks, the orange blocks are subsystems containing additional Aerospace Blockset blocks, and the white blocks are Simulink blocks. How to use MathWorks® products to address the technical and process challenges of aircraft design using the design of a lightweight aircraft. 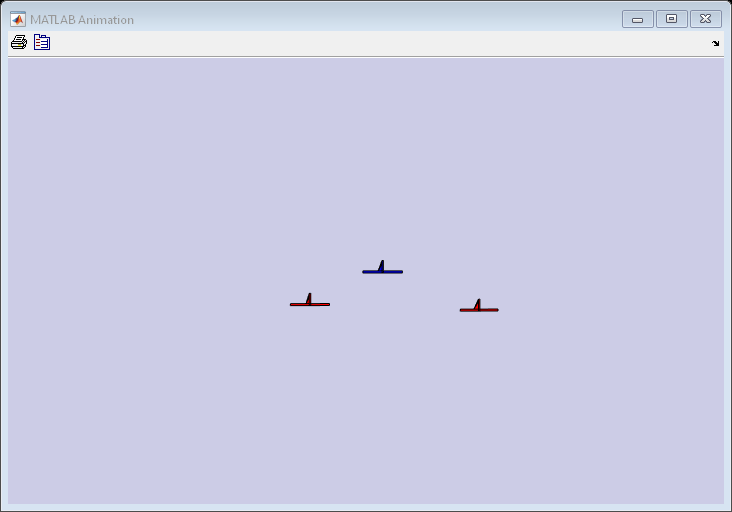 The simulation of multiple aircraft in formation flight, with emphasis on the necessary requirements and the realized benefits in making the simulation vectorized so that it can easily be updated for an arbitrary number of vehicles. To perform their avoidance task, this set of aircraft uses cooperative control. This project shows how to model NASA's HL-20 lifting body with Simulink®, Stateflow® and Aerospace Blockset™ software. The vehicle model includes the aerodynamics, control logic, fault management systems (FDIR), and engine controls (FADEC). It also includes effects of the environment, such as wind profiles for the landing phase. The entire model simulates approach and landing flight phases using an auto-landing controller. To analyze the effects of actuator failures and wind gust variation on the stability of the vehicle, use the "Run Failure Analysis in Parallel" project shortcut. If Parallel Computing Toolbox™ is installed, the analysis is run in parallel. If Parallel Computing Toolbox™ is not installed, the analysis is run in serial. 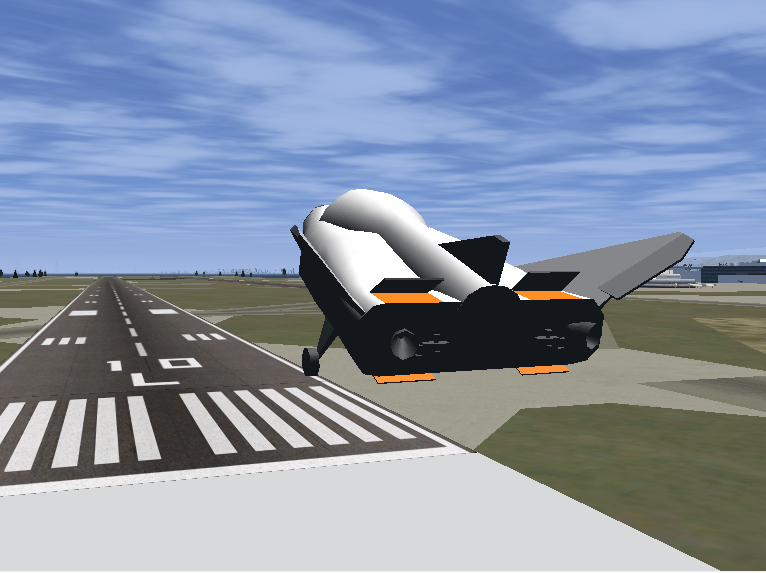 Visualization for this model is done via an interface to FlightGear, an open source flight simulator package. If the FlightGear interface is unavailable, you can simulate the model by closing the loop using the alternative data sources provided in the Variant block. In this block, you can choose a previously saved data file, a Signal Editor block, or a set of constant values. This example requires Control System Toolbox™.